Be prepared to accept the next invitation. 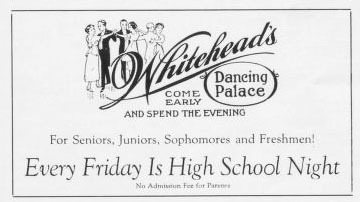 Learn to dance at Whitehead's. We offer both class and private instruction. 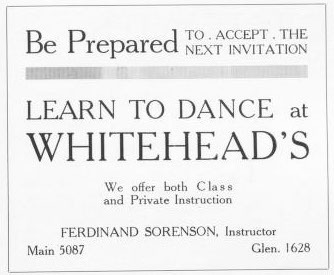 Ferdinand Sorenson, Instructor. Main 5087. Glen 1628. Come early and spend the evening. High school class (14 to 19 years, inclusive) every Friday, 7:15 to 8:30 p.m. Children's Class (5 to 13 years, inclusive) every Saturday, at 3. 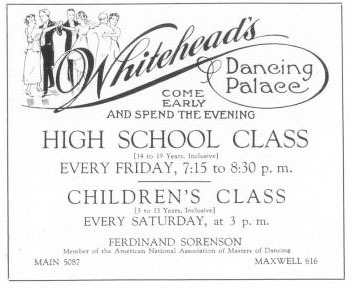 Ferdinand Sorenson, Member of the American National Association of Masters of Dancing. MAIN 5087. MAXWELL 616. Come early and spend the evening. As your pleasure is ours also, we wish particularly to cater to your desires - to accord you the most cordial of welcomes - to assure you of the ultimate in enjoyment and service. 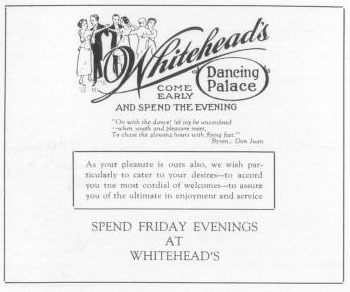 Spend Friday Evenings at Whitehead's. Come early and spend the evening. For Seniors, Juniors, Sophomores and Freshmen! Every Friday is High School Night. No Admissions Fee for Partners.